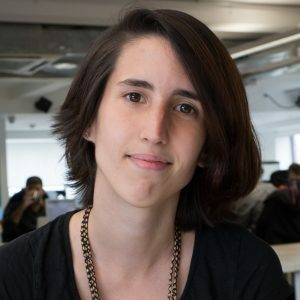 We interviewed Susana Lopes, Product Manager at Onfido on her experience and thoughts on women in tech. As a product manager I work directly with a cross functional agile delivery team who builds software. My role is to discover valuable problems we should solve with our software, which clients are willing to pay for and need. At Onfido our teams are cross functional and include software engineers, machine learning engineers and researchers, testers, user experience designers and data analysts. Together with my team, we build biometric matching technology which confirms your face matches the one on your government issued identity document, so you can verify your identity online. I love problem solving, working on creative ideas and talking to people. This made product management an extremely good fit. I studied biomedical engineering at university, which was very technical. We did some programing and machine learning. So I do come from a technical background. Yes, I worked as an intern at Cisco while still at university, and did three and a half years as a product manager at Huddle. Yes, the gender balance isn’t right at the moment. Not really, particularly as there are so many different roles in the industry. But there is a distinct lack of female developers, as well as female students of computer science. Because most technology firms need more developers than other roles, this results in overall very gender imbalanced organisations. I find that a lot of women come to software development later in their careers rather than studying it at university, which results in most female developers being junior developers, rather than senior architects. But things will change over time as more and more females join the workforce as developers. Role models, other successful women in related jobs. A lot of the barriers are around expectations and self perception. A lot of the time it’s self exclusion that happens “oh that’s not for me”. If you brand tech as a guy thing, a lot of girls will self exclude from even trying it. Where in reality women who give it a go are likely to like it and be very good at it. There’s also the case where it’s also institutional, where teachers might discourage girls from doing advanced maths, or tech subjects at school. Women and girls need to ignore this barriers and try it for themselves instead of letting someone else tell them what they will like or be good at. Making sure the culture of the organisation is inclusive is important, such as not branding people as ninjas/rock stars or other similar terms, or making the culture all about pop culture nerd references. It’s important to not confuse pop culture knowledge with culture fit. You can get around this by objectively listing the values or behaviours the company stands for. Hopefully making sure these are not biased. We have done this at Onfido by introducing Onfido Values. During the recruitment process we have an interview just focused on these, and employees receive prizes for exhibiting theses behaviours. Generous parental (not maternity or paternity, the same for both) leave, and flexible working are important. Onfido has a generous maternity leave policy, and flexible work hours, which is helpful. Generally showing success stories of female role models is key to inspire the next generation. Not just the Marissa Mayers of this world, computer science stanford graduate, only taking 2 weeks maternity leave. But a diverse spectrum of people, who might not have studied technology and are now successfully working as developers, while having taken maternity leave and balancing time with their family in a way that works for them. The thing about role models is that you need many different ones so that there’s a chance they are similar enough to someone young and they can take inspiration from them.